You can now change which Cloud Server an additional IP addresses is routed to. This makes it possible to, for example, switch between Cloud servers while avoiding any downtime. Please note: You can only reroute additional IP addresses, and only between Cloud Servers within the same zone (York or Manchester). If you want to switch seamlessly between servers, each server must be setup to recognise the IP address beforehand. See Adding Extra IP Addresses for more information. Login to the Bytemark Panel and select the ‘IP Addresses‘ tab from the menu. A ‘Reroute‘ button will be displayed to the right of any IP address which can be rerouted. Click this button for the IP address you want to modify. 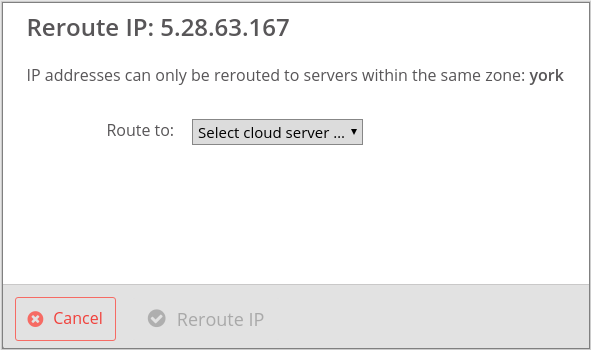 From the dropdown list, select the server you want to reroute the IP address to, and click the ‘Reroute IP‘ button. After a few seconds, you should receive confirmation that the change has taken place. Click the ‘Got it‘ button to close the window.